I don't know if it is something in the water around here, but I don't know a single pregnant woman that is having a boy. It seems that there are lots of girls waiting to make their entrance to the world. It is actually quite a treat for me because it gives me the opportunity to try out some new projects. I recently purchased some Joel Dewberry fabric, it is actually decor fabric, but the moment I got it I knew that I wanted to make a baby dress out of it. 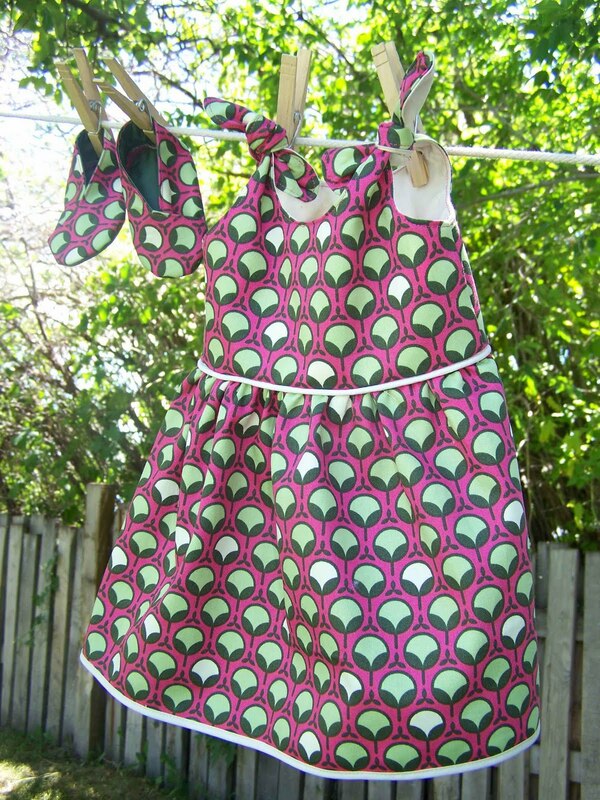 Made by Rae offers this free online pattern for an Itty Bitty Baby Dress. The pattern is for personal use so don't go out and try selling anything that you make from the pattern. I was surprised at how simple the pattern was. It really didn't take much time at all to make. Rae's pattern is for a premie to newborn baby, but you can add to the pattern to accommodate a slightly larger baby. Small babies don't really run in our family so I am always afraid to make anything that would be too small. I decided that this cute little dress needed some cute little booties to accompany it. Normally I make a 3-seam baby bootie, just because they seem like they actually stay on the baby's feet, but this time I decided to try something a bit different. 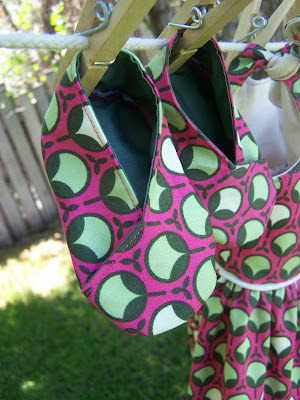 I found this pattern for kimono booties at Home Spun Threads. I used the same Joel Dewberry fabric and some dark green cotton for the sole. The booties turned out cute, I hope that they fit the baby's feet. Clark seemed to have huge feet when he was born; they were puffy and wide so I don't think that they'd have been able to squeeze into these dainty little things. When I'm sewing for others I always strive for the cute factor more so than the practical factor. Hopefully the recipient of these booties has babies with narrower feet than mine. Like I mentioned earlier I know multiple people having baby girls. I had to give this Itty Bitty Baby Dress another try. I decided that the second time around I would make a few modifications. I chose to put pleats in the dress rather than gathering the skirt (I dislike gathering...I always break a thread). I also squared the neckline off a bit. I like the way that the dress turned out, but I did have a more difficult time lining up the seams with the pleated skirt. I haven't made any baby booties for this little number yet, if anyone has some suggestions of where to look let me know. 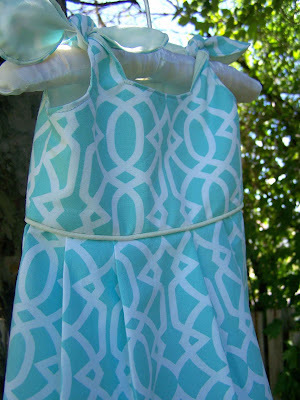 My camera's battery died mid-photo shoot, so I don't have as many photos of the little aqua dress. 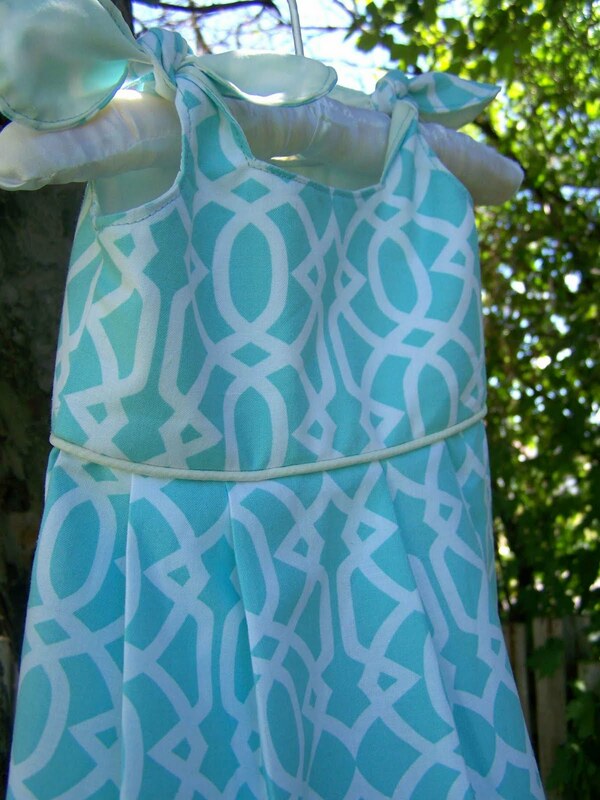 The fabric for the aqua dress is Michael Miller. 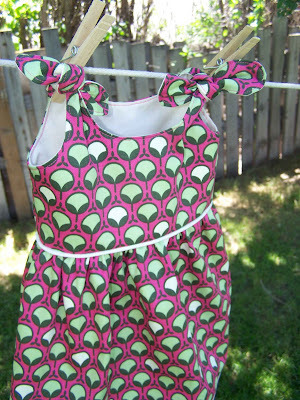 Now I think that these little dresses need some cute little headbands to add that last little something. That will be a project for a later post (hopefully not a failed project). I also no several babies coming this winter...anyone know of some great projects for winter babies? So cute! I love the dresses and booties!